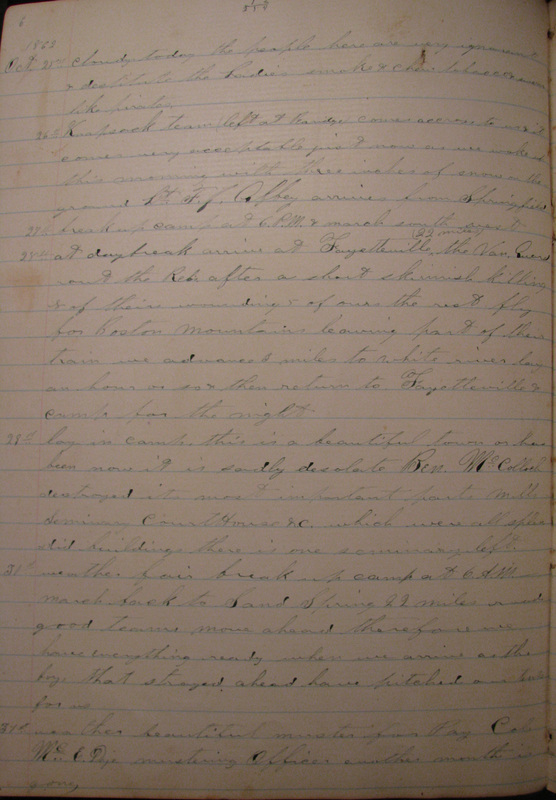 The journal appears here as a transcription of the original document. Alcander's spelling and punctuation have been maintained. Any questionable or illegible words have been clearly marked in brackets. To facilitate the ease of reading the journal, it has been organized by year. In pursuit of Confederate General Marmaduke through Missouri and Arkansas; the Battle of Newtonia; revisiting the battlefield at Pea Ridge; 130 mile march in three and a half days; the Battle of Prairie Grove. Revisiting Pea Ridge; the Battle of Cape Girardeau; the Battle of Chalk Bluff; 180 mile march in eight days; traveling the Mississippi River on transport ships; the Battle of Vicksburg; visiting New Orleans; boating to the mouth of the Rio Grande. Traveling from Texas to Illinois via transport ships; home on furlough and recruiting duty; visiting family and friends at home in Boone County; the end of the Red River Campaign; duty in Louisiana and Mississippi; mustering out and returning home. As part of my on-going research of Alcander and his journal, I have begun providing annotations with contextual information where necessary. 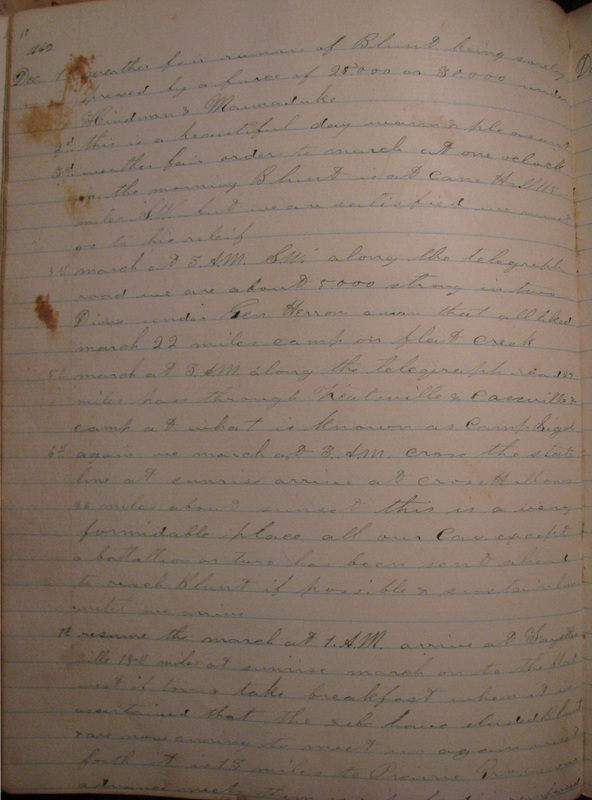 I have also started adding page images of the original journal. 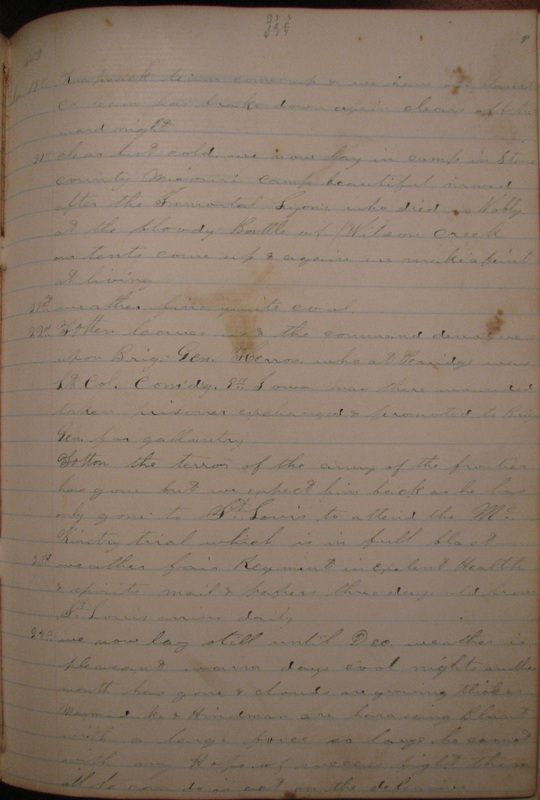 Various generations of Alcander Morse's descendants have contributed to the preservation of his journal over the years. 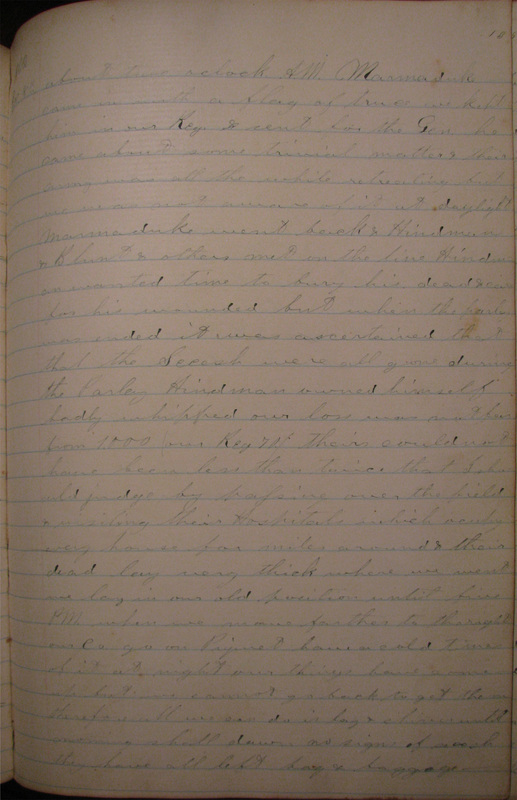 Following Alcander's death in 1894, the journal passed into the possession of his youngest child and only son, William Morse. 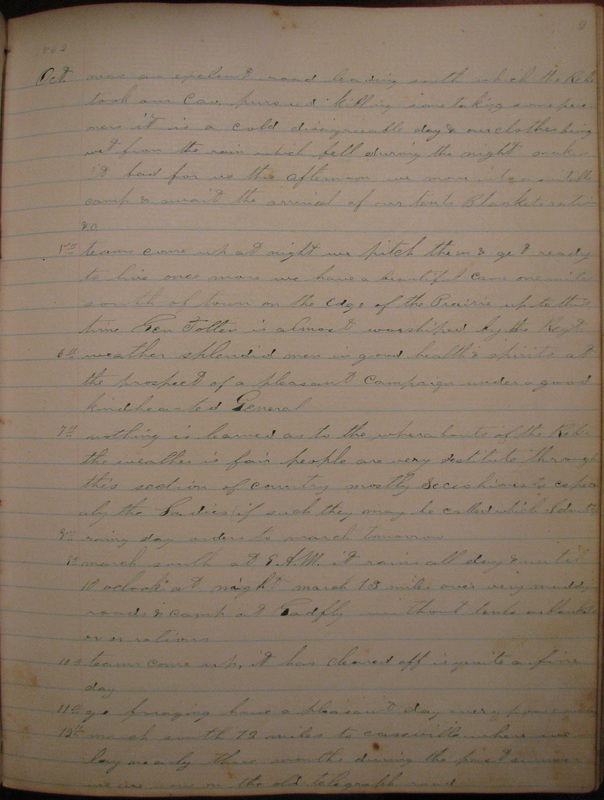 In 1925, Charles A. Nash, Alcander's grandson through his eldest child, Amy, borrowed the journal and undertook the painstaking task of transcribing it on his typewriter. 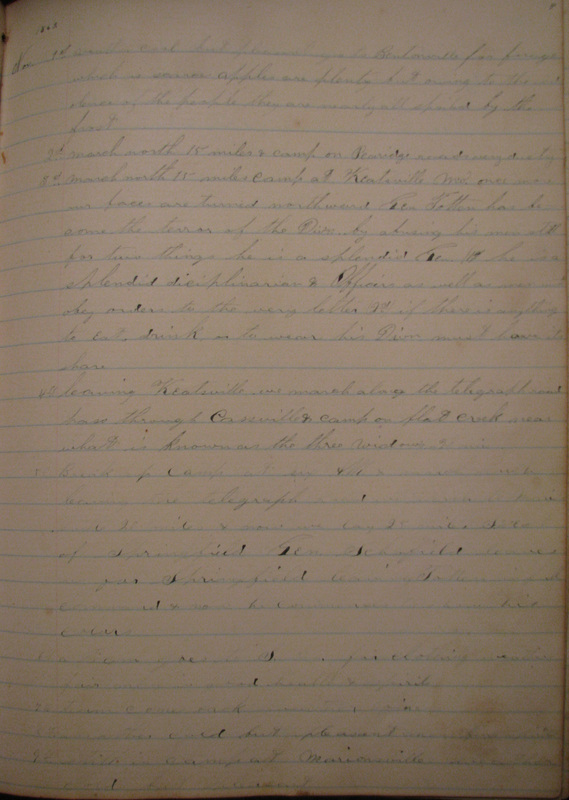 He distributed various abridged versions of this copy of the journal amongst members of the Nash family. For example, see this 1963 letter to his cousins, attaching an abbreviated version of the journal. In 1995, Charles Nash's grandsons, Robert and Chuck Nash, began to input the typewritten copy of the journal into a word processor. A small booklet was made and donated to the library at the Prairie Grove Battlefield State Park in Arkansas, where it has been referenced in numerous published works. The current location of Charles Nash's original typed copy is unknown. 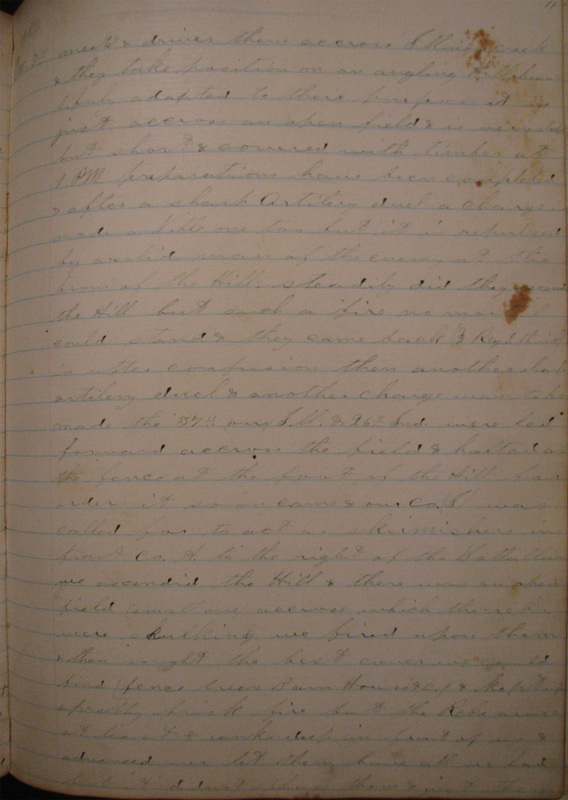 Growing up, I was fascinated with this particular piece of family history, and as my research in the Civil War era began to focus upon the personal narratives of soldiers, my thoughts would frequently return to Alcander's journal and its present whereabouts. In 2010, I attempted to track it down. Through of a bit of genealogical research, I was able to locate the descendants of the last known possessor of the journal, and eventually, the journal itself. Not only had it survived the wear and tear of three years of war, but it had successfully made the postwar journey from Illinois to South Dakota and Iowa, finally settling in Northern California in the hands of its author's great-great-grandson. Upon examining the original volume, it was immediately clear that the version of the journal I had been analyzing for years was incomplete. 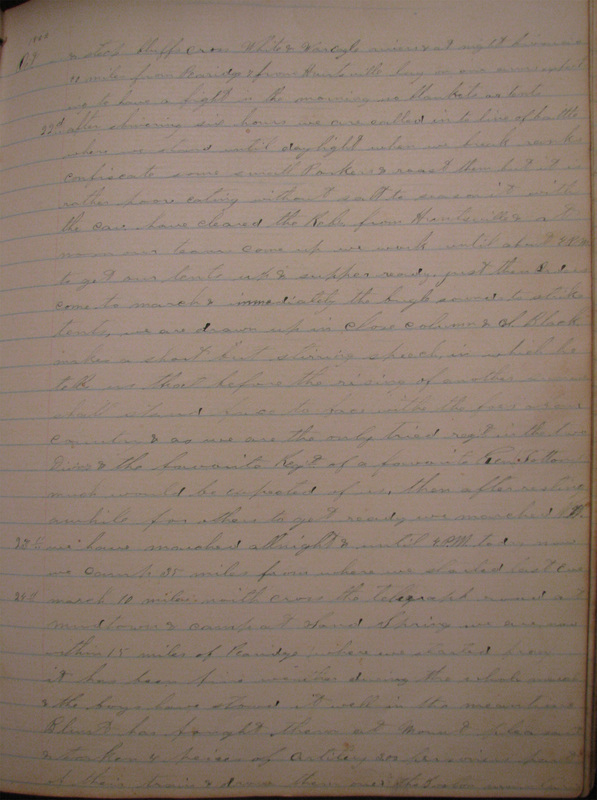 During his 1925 transcription process, Charles Nash had evidently taken certain liberties to make the text of the journal more readable. Punctuation had been added, repetitive passages regarding the weather had been removed, grammar had been corrected, and a surprising number of words and sentences were omitted. The original also contained many pages of poetry, presumably written by the author during his wartime travels. 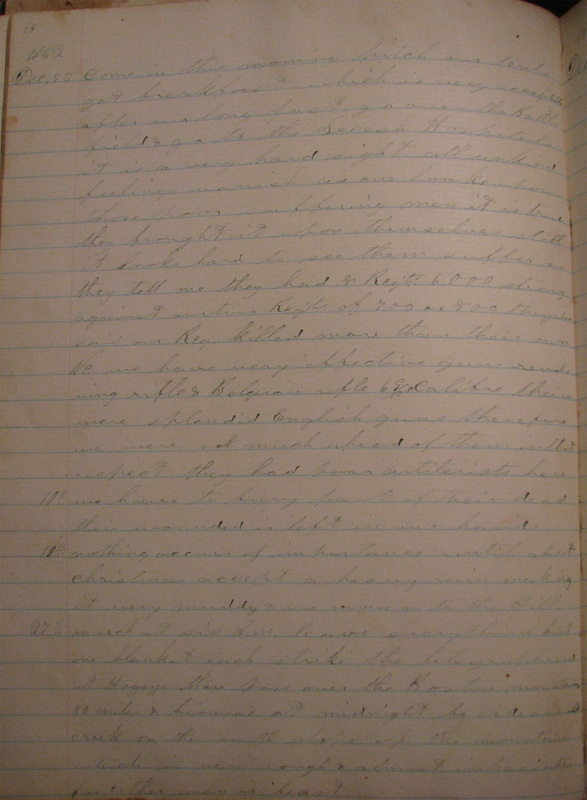 It seemed that not only had I found the original journal, but I had also uncovered the author's original voice. One peculiar trait of the journal is its size. 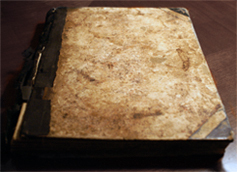 The journal in the possession of Alcander's descendants is ledger sized, while most journals of this era are much smaller, pocket-sized books. It is possible that this version of the journal may not be the physical copy Alcander carried with him throughout his war service. It may be that the worn condition of the original led Alcander to pen an exact copy in a book that he already had in his possession. If that is the case, he took special care to create an identical copy, right down to the mysterious notations in the margins. I am inclined to believe that it is the original that survives, and that the size of the book is what made it necessary to leave the journal behind, prompting one of my favorite passages: "this afternoon we have to march leaving everything except what we can carry on our back in our knapsacks therefore my dear old journal (over which I have passed many a lonely hour) you & I like all friends in this weary world must part not knowing whether either may survive the ravages of war I bid you a sorrowful adieu." Regardless of the journal's history, its authenticity remains unquestioned, as does its usefulness to the field of Civil War studies. During this month while we have been building Fort No 1 Spring field Missouri, quite a No of Regiments have arrived from the north & now the Army of the Frontier is formed Brigadier Gen. Schofield Com'd'g. the 1st Div'n is already formed & in Kansas Brig. Gen. Blunt Com'd'g. 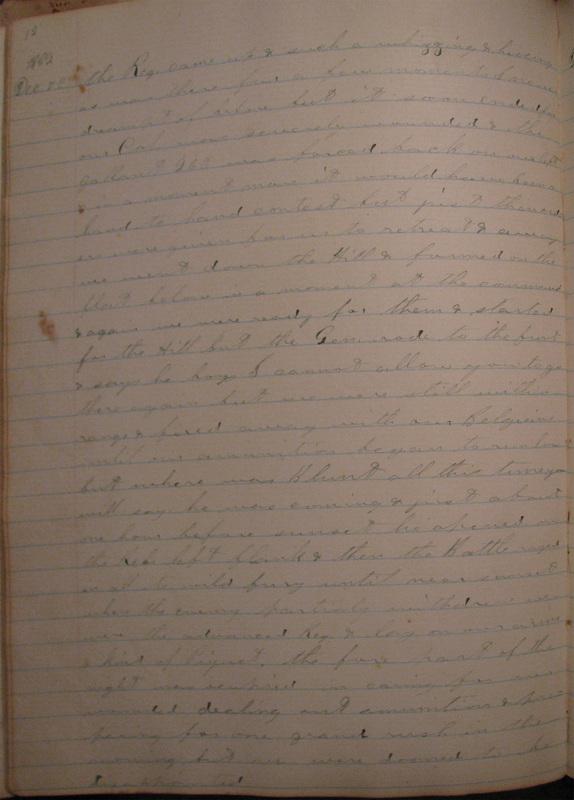 the 2d is composed out of the following Reg'ts to wit— 1st Brigade 18th Iowa & 26th Ind Inf'y Batery E, 1st Mo. light Artilery & the 7th Mo. Cav. Col. Wheatly com'd'g. Brigade. 2d Brigade 20th Iowa & 37th (ours) Ill. Inf'y Batery F, 1st Mo. Light artilery & the 1st Iowa Cav. Col. Wm Mc E. Dye com'd'g. Brigade. Brig. Gen. Jas. Totten com'd'g Div'n. 3d Div'n 19th Iowa 20th Wis'n & 94th Ill. Inf'y Batery L 1st Mo. 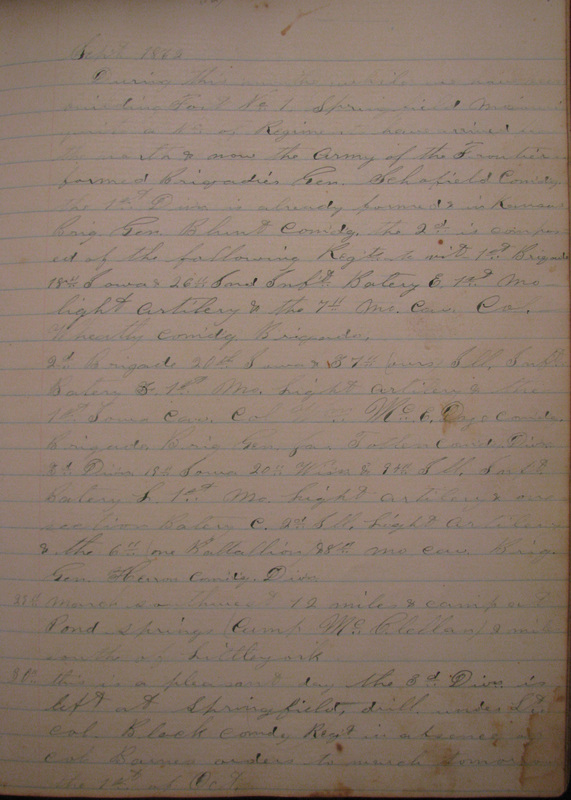 Light artilery & one section Batery C 2nd Ill. Light Artilary & the 6th (one Battallion) & 8th Mo Cav. Brig. Gen. Herron com'd'g. Div'n. 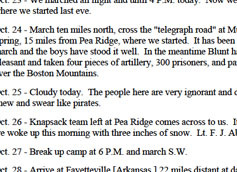 29th March southwest 12 miles & camp at Pond Springs (Camp McClellan) 2 miles south of Littleyork. 30th this is a pleasant day the 3rd Div'n is left at Springfield. drill under Lt Col. Black, comdg Reg't in absence of Col. Barnes orders to march tomorrow the 1st of Oct.
2d march at 6.A.M. southwest 20 miles pass through Mt Vernon a beautiful town over magnificent Prairies studded with small Groves camp at the head of Spring River. Oct. was an excelent road leading south which the Reb's took our cav. pursued killing some taking some prisoners it was a cold disagreeable day & our clothes being wet from the rain which fell during the night makes it bad for us this afternoon we move into a suitable camp & await the arrival of our tents Blankets rations, &.c. 5th teams come up at night we pitch them & get ready to live once more we have a beautiful came one mile south of the town on the edge of the Prairie up to this time Gen Totten is almost worshiped by the Reg't. 15th weather fine roads excelent Perris, my Step Bro. is sick today also one of our Serg'ts. 16th take Perris to the Hospital & prepare to march on the morrow by Order. 19th obtain permission & look the Battle field over it looks familiar go to our (37th) old burial place at leetown it looks very well. 22d after shivering six hours we are called into line of battle where we stand until day light when we break ranks confiscate some small Porkers & roasted them but it is rather poor eating without salt to season it with the cav. have cleared the Reb's. from Huntsville & at noon our teams come up we work until about 4.P.M. to get our tents up & supper ready. just then Orders come to march & immediately the bugle sounds to strike tents. we are drawn up in close columns & Col. Black makes a short but stirring speech, in which he tells us that before the rising of another sun we shall stand face to face with the foes of our country & as we are the only tried reg't in the two Div'ns & the favorite Reg't of a favorite Gen (Totton) much would be expected of us. then after resting awhile for others to get ready we marched N.W. Oct. 25th cloudy today the people here are very ignorant & destitute the Ladies smoke & chew tobacco & swear like pirates. 29th lay in camp. this is a beautiful town or has been now it is sadly desolate. Ben McCulloch destroyed its most important parts mills Seminary CourtHouse &.c. which were all splendid buildings there is one seminary left. 31st weather beautiful muster for Pay Col. Mc E. Dye mustering Officer another month is gone. 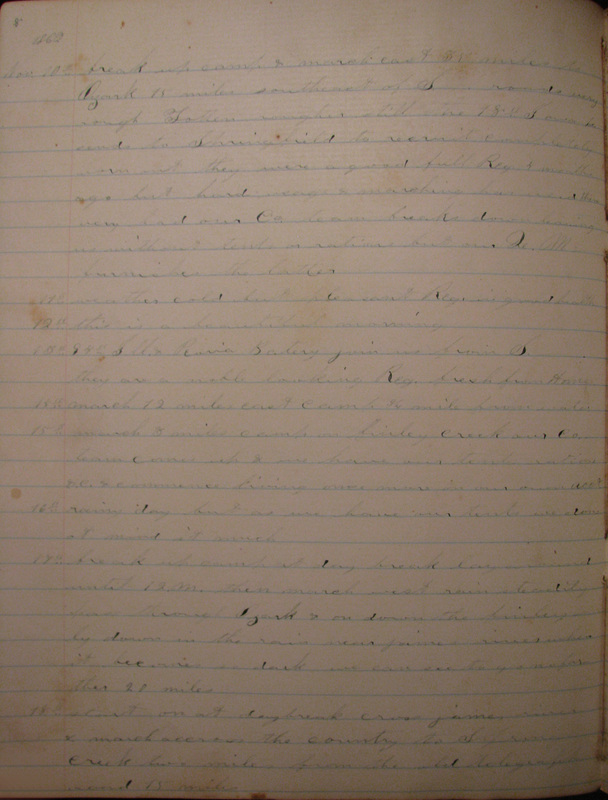 Nov. 10th break up camp & march east 35 miles to Ozark 15 miles southwest of S roads very rough Totten rougher still the 18th Iowa he sends to Springfield to recruit completely worn out they were a good full Reg't 4 months ago but hard usage & marching has used them very bad our Co. team breaks down leaving us without tents or rations but our Q.M. furnishes the latter. 15th march 3 miles camp on finley creek our Co. team comes up & we have our tents rations &.c. & commence living once more in our own acct. 21st weather fine. quite cool. 3d weather fine our C. (Black) is doing well also the boys that were wounded from this Reg. 6th march 8 miles S.E. camp on White river. 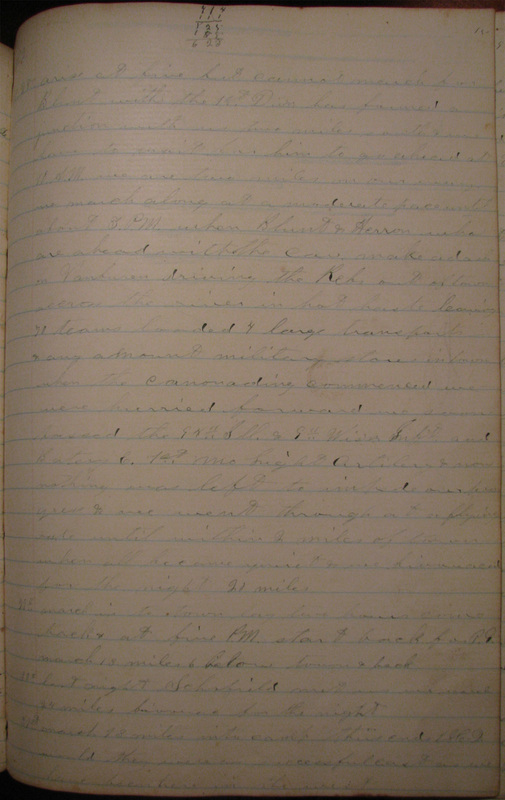 27th last night five of our men deserted taking four good Horses one mule saddles &.c. with them come back to camp Bliss weather fair roads good &.c. 17th this has been a splendid day a detachment has been clearing off camp & a parade ground we have a magnificent camp on a beautifully sloping hill covered with small trees shrubbery &.c. in front (north side) in the valley lies Elk Creek beyond is high bluffy Hills in the rear (south side) in the valley murmurs a small rivulet leaving us on a hill & still in a valley for beyond the rivulet is high Hills. Batery E. 1st Mo. Light Artilery joins us, Gen. Totten has procured two small pieces (58/100 Calibre) to go with his Body Guard Union preservers I believe he calls them but if the Union is to be preserved by them we shall be obliged to wait some time yet before peace is declared. 28th weather good forage train goes out again Col. Wickersham (of the 10th Ill. Cav.) is in command of our division a very fine appearing man we have a large Garrison flag up on our parade ground men in good Health & spirits & under excelent dicipline & pretty well drilled what there is left of us. 3d Cav. march at 7.A.M. Inft. at 8.A.M. cross the Gasconade river & proceed N.E. 14 miles camp on the Rubudue Creek it is a beautiful day for marching just cool enough for comfort. 8th Grand review by Major Gen. Herron who has now assumed the command of the army of the Frontier Brig. Gen. Van Dever assumes the command of the 2d Div'n both were formerly of the 8th Iowa Inft. Apr. 9th this is a beautiful day the roads are in excelent condition trains arrive daily with clothing Rations forage &c. from Rolla. 14th it rained most of the time last night & is still raining Health of the Reg. good. 9th a beautiful morning arrive at 12.M & march to Camp Gamble (3 miles) have inspection pitch our tents &.c. 18th it is a beautiful day all Nature looks smiling & gay the summer is upon us in all its beauty, the Spring is fast going, but we gladly exchange it for beautiful summer with all its shady bowers & handsome flowers Excelent fruits &.c. With all its leafy bowers. 29th rain part of the day, go to Ironton & the Knob Geo. Kennicott has been our 2d Lt three weeks 1st Serg't Wm B. O. Sands 2d A. J. Higgison 3d G. I. Tripp 4th T. J. Stow 5th D. H. Jones Serg't Geo. H. Merrill has been promoted to 2d Lt of Co. H. of this Reg. 31st very heavy rain last night but this morning it has cleared off & is now a beautiful day Spring has surly left us & now comes summer with its rich Warmth[?] & its beautiful flowers [illegible] &.c. 15th it is a beautiful day we are now the 1st Reg. (Col. Chas. Black com'd'g.) of the 1st Brigade (Col McE Dye comdg Brigade) of Van Devers Div'n of Herrons Command two cos. from Each Reg. advanced as Piqiuets (called sharpshooters here) our Major (Payne) is detailed as Project Officer for Herrons Corps. Blackberries & Plumbs are ripe & plenty. 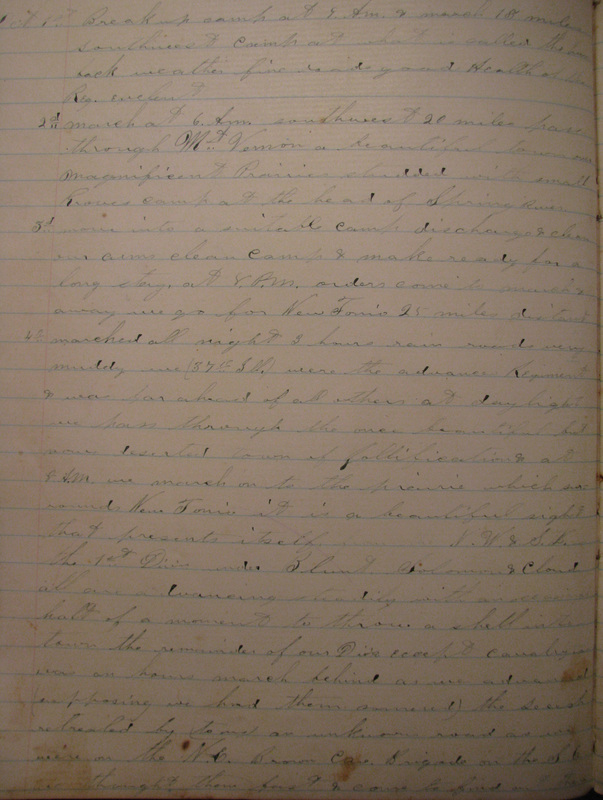 18th come back to camp go to the 38th Iowa find a cousin (Orson Morse Co. K.) that I have not seen for a long time. the seige continues our lines steadily & they must give up soon or be driven into the Heart of the City. 22nd last night our Piquets had quite a skirmish but lost nothing by it this morning we go out to support our sharpshooters while they advance our lines it is handsomely done with but little loss on our side it is a beautiful day. 28th weather is very beautiful the seige continues but not quite so fierce as heretofore last night all was quiet the beseiged seem loath to part with their amunition & the beseigers seem willing to let them keep it for we are satisfied that the want of food is more than the want of amunition with them deserters continue to come in very warm this P.M.
July 4th by U.S. Grant the Pet of the Army of the Tennessee a man that prepares to do a thing before he does it or commences & then goes unfalteringly forward never once halting until his end is is accomplished this is indeed a glorious day to the Arms of the U.S.
29th weather continues beautiful still waiting for the Gen. to come back or send us orders what to do. 30th Herron has returned & we have orders to march at 4.P.M. Eve_ we did not march today but expect to go in the morning. 18th rainy morning but looks as though we might have a fine day yet, two years ago today I Enlisted then the opinion was the war would End in six months two years of toil & pain two years of blood & slaughter have passed & alas for Human calculations it is not at all likely the war will End within six months "Man proposes, God disposes"
20th weather fair run up the river 6 miles land & take our position beside the levee in the town of Morganza Coupee Parish L.a.
6th march one mile along the road turn & go south two miles & lay over on a fine plantation until Evening when we march two miles back to the road & three miles along it then lay still until morning one section of artilery comes to us & things begin to look as though we might make an advance in the morning we are now one mile from where those two Regiments were taken in the 28th of Sept.
10th Embark at 6.A.M. & start down the river it is a beautiful day we pass Port Hudson about ten A.M.
11th splendid morning land at 9.A.M. & march nearly one mile & ocupy a camp near our old one (when we were here in August) I obtain leave of absence & go to see our sick in the Convalescent Camp near Carlton, L.a.
4th cross the Bar & land on the Island it is nothing but a sand hill go hunting shell some beautiful ones are found by myself and Corporal Dukitte also one oyster. 12th weather good the people look very inferior very dark &.c. 25th Christmas morning for the third time since we Entered the service, then it was thought by all that one Christmas would be all we would spend in the service & now the same question arises will we Ever spend another Christmas in the service of our Country. 11th got stuck on the Bar last Eve & did not get loose in time to run out now we cross the Bar at 9.A.M. 20th Embark on board U.S. Transport J. S. Pringle & start up the river at 11.A.M. 23d fine morning see my cousin Albert Drake this has been a beautiful city garrisoned mostly by colored troops all but the 28th & 29th Illinois & 4th Ill. Cav. 24th Arrive at Vicksburg at 2.P.M. go & see my friends in the 95th Illinois the old Reg'ts here are nearly all reenlisting how I wish ours would go in for another term but I scarcely think they will under our present Col. (Black) Payne rec'd his commission as Lt Col. in N.O. if it had been as Col. the boys would all Enlist or nearly all I think. 8th leave Belvidere at 9.A.M. arrive at Home at 10.A.M. 9th very cold but pleasant after all visit Charlse Cummings, L. L. Tongue, Cranes, Draper, &.c. Feb. 11th at Warren Morses with my Mother Stepfather Levi & Adaline Alferd & Emma, Warren & Mary, Miron Avery & Lady Ruth, Henrietta, Mrs. Tongue, Legran &.c. 27th go to see C. A. Anderson and L. N. Tongue &.c. 3d come Home at Eleven after a very pleasant visit go to Jacksons to see the sick people in the P.M. Lucy is very sick James Stow is gaining slowly. 30th come Home cloudy weather go to church at the W.C.
4th rainy day, stay at Home. 16th go to town come Home & go to Drapers Newells &.c. April 25th rainy day start at 9. A.M. for Belvidere very weak this morning but feel quite well bid adieu to Old Bonus for a long long time, leave Belvidere on the 12=10. P.M. train run into Chicago stay at the Matteson House. May 1st this is a beautiful morning & well worthy to be called the first of the smiling month of May nothing reliable as yet from the Cavalry Expedition that started yesterday morning Orders to march in the morning at five Oclock. 5th march at 8. A.M. cross the Hatchie & march 18 miles into Miss. camp near Corinth Miss. 6th weather fair march 15 miles & camp near Ripley Miss. 12th have passed Helena during the night & now 11. A.M. we are passing Napoleon (mouth of the Ark River) lay up on a beautiful Island an hour while the boat is cleaned & rations cooked for one day. come on board & proceed down the river weather beautiful. 14th have run all night arrive at Natchez at 6. A.M. inspection of Arms at 5. P.M. good news from U.S. Grant Lee retreating Bank[s] on Red River is having pretty hard times, most likely we shall go to his releif tomorrow. go to the camp of the 58th U.S. Colored Infry. & see Albert Drake Orderly Serg't Co. A. it is beautiful weather here at present, the best part of this town was burned last night Sherman in Ala. is doing well Butler too has done his share cutting the Rebel communication between Richmond & Charleston still there is room for Bright anticipations. May 15th In Bivouac at Natchez Miss. move off the boat last Eve This is a beautiful morning in the prettiest City I have yet seen in Dixey, such pretty Flower Gardens Walks, Parks & so many Lovely Ladies still they are Southern Ladies Embark on Board Hazel Dell for Red River. May 24th weather fair but very warm go on Piquiet at 7. P.M.
3d rainy, mail comes at noon. 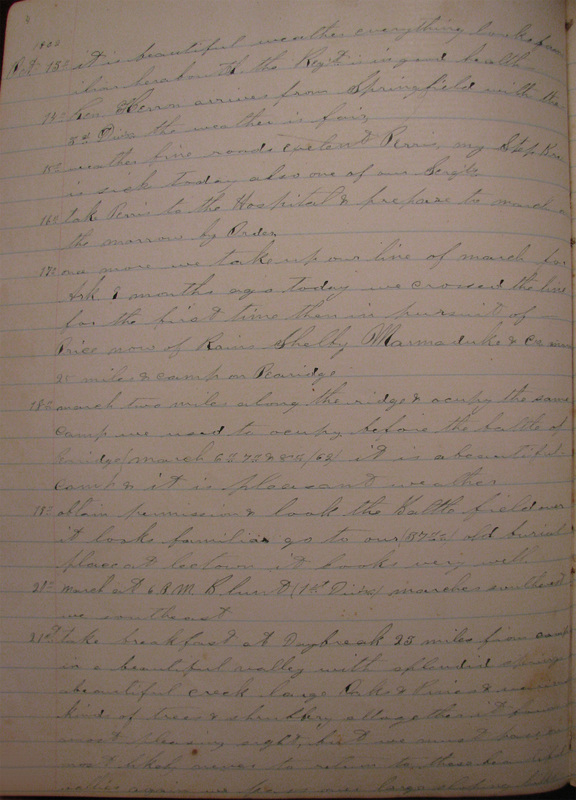 (5) Orders for Inspection at four. P.M. but rain prevents it & so we wait until a fair day. 5th go to the camp of the 92nd U.S. Inf'ty. Colored to See Cap't Sands & Lieut. Tripp weather fair most of the time occasionally a shower just Enough to lay the duct & cool the air. 8th pleasant but very warm a Division of the 19th Corps & the Cavalry start out on a scout go up the River all is quiet in front this morning, if we only had Competent Commanders we could soon drive these Guerrilla's off our track but now we must lay here & be dogged almost into camp if we venture out on a scout it is Great business this. 27th weather fair, go out side the Piquiets after wood return at ten O.C. 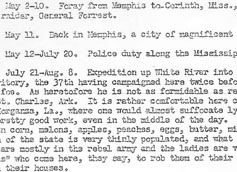 A.M.
28th beautiful weather but very warm good news from Genls Sherman & Grant rather bad from Sturgis, he has made another of his grand moves & has been defeated & obliged to retreat to Memphis Tenn.
10th lay here ready to Embark as soon as Transports can be gathered to carry the Brigade (1) mail comes at 9. A.M.
25th fine weather work on Fort No 3. St Charlses Ark. Gen. Marmaduke reported forty miles distant with from 8000 to 14000 men marching on this place our forces [illegible] 2.500 men or near that inclusive one six Gun Batery & five Reg'ts of Infty. July 27th weather fair still at work on Fort No 3. Marmaduke is played out, Gen. Lee has run that scarecrow as far as he can at present. 28th Light showers 20 from this Reg. go out foraging mounted on Batery Horses we have a gay time, plenty of green corn, melons, apples, Peaches Eggs butter milk chickens &.c. &.c. 7th start down the River at 8. A.M. stuck on a sand Bar at 12. M.
8th arrive at the Mouth of White River at 10. O.C.A.M. but our fleet is not all here yet land & wait Embark at night mail (8) at 3. O.C.P.M. 14th pretty warm on guard on board U.S. Transport "Free Stone"
19th start at 4. A.M. run as far as Decatur & lay over until Six P.M. then proceed to Camp Butler Near Springfield Ill.